Recovering important photos and data from a malfunctioning hard drive can be surprisingly expensive. Depending on what goes wrong and whom you take it to, it’s not unusual for data recovery companies to charge thousands of dollars. If you have drives full of files you can’t afford to lose, then it may be worth it to consider hard drive insurance. That’s exactly what Seagate is offering with its new Seagate Rescue and Replace plan that covers the cost of data recovery and device replacement in the case of virus, mechanical failure, or accident. With Rescue and Replace, there’s no need to panic should anything go wrong with your hard drive. Just contact Seagate and they’ll send you a box to mail your hard drive in. A technician will then recover your files, put them on a brand new drive, and mail them back to you. Keep in mind, though, that not all files may be recoverable. Of course, your first line of defense should always be a local or remote backup. Still, extra protection – especially a white-glove service like Seagate’s – certainly wouldn't hurt. 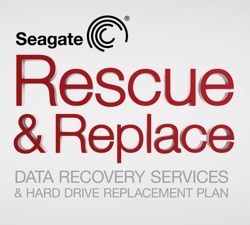 Seagate Rescue and Replace starts at $39.99 for 2 years of coverage; $59.99 covers you for 4 years. That's less than the cost of a dedicated backup drive. For an even less expensive option, Seagate Rescue provides data recovery protection without complimentary hard drive replacement for $10 less. Coverage is available at Seagate.com, and will soon be offered when you purchase a new computer with a built-in Seagate drive. To learn more about Seagate Rescue and Replace, watch the video below or visit the program’s home page.